It's about value. It's about respect. It should not be about fear. UC Davis entomology major Lohitashwa “Lohit” Garikipati, who will be displaying his praying mantis collection at the Bohart Museum of Entomology during the seventh annual UC Davis Biodiversity Museum Day on Saturday, Feb. 17, is keenly interested in sharing information about insects. 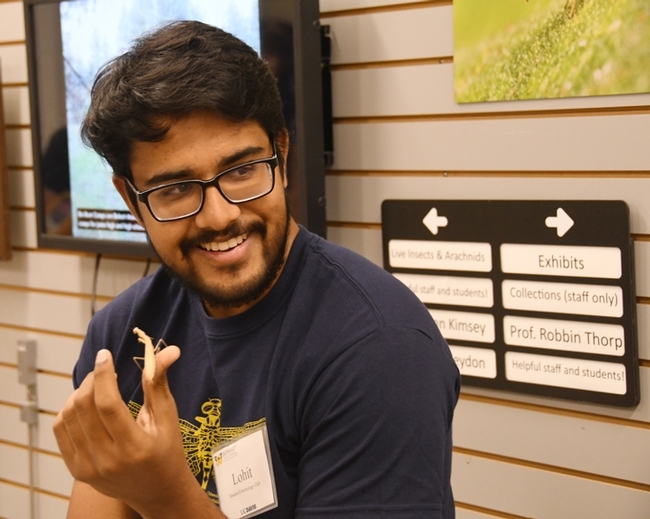 Lohit (pronounced “Lo-Heat”) serves as secretary of the UC Davis Entomology Club, which is advised by forensic entomologist Robert Kimsey of the UC Davis Department of Entomology and Nematology. Three third instar Decimiana bolivari (there's no agreed upon common name, but they can be called South American dead leaf mantises, he says). Meanwhile, visitors can see learn all about praying mantises--and hold and photograph them--from 9 a.m. to 1 p.m., Feb. 17 at the Bohart Museum, located in Room 1124 of the Academic Surge Building, Crocker Lane. 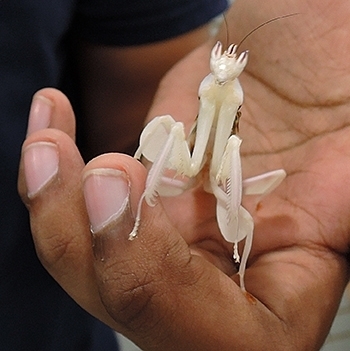 The Bohart, directed by entomology professor Lynn Kimsey, is the home of a global collection of nearly 8 million insect specimens, and a live "petting zoo," comprised of Madagascar hissing cockroaches, stick insects and tarantulas. Also on Feb. 17, highlights at the Bohart Museum will include the 500,000-specimen butterfly/moth collection, curated by entomologist Jeff Smith; and an insect collection display by Smith and fellow Bohart Museum associates Fran Keller and Dave Wyatt from their latest expedition to Belize. 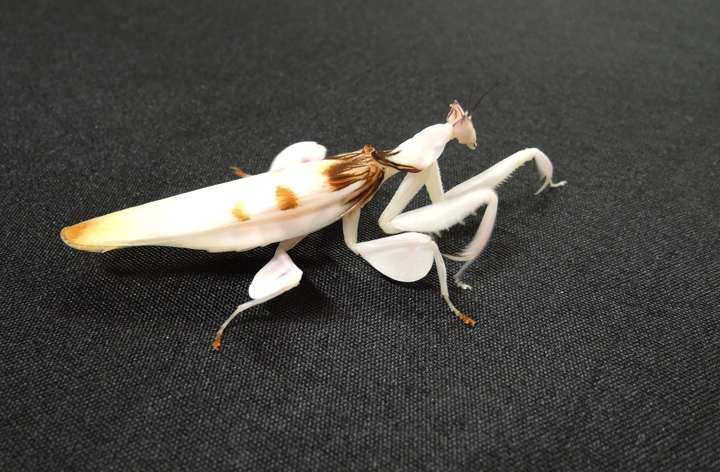 "You'll be able to see the tremendous diversity of butterflies, moths and mantids, and talk to the scientists who have just returned from there," said Tabatha Yang, education and outreach coordinator. 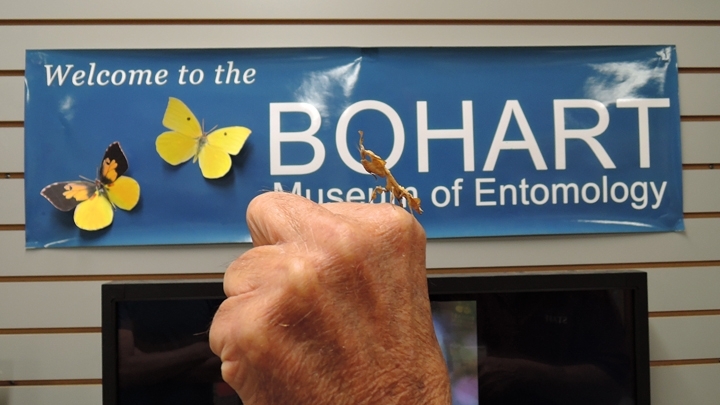 "There will be orchids and orchid bees connecting the Bohart Museum's work with plant biology and science." 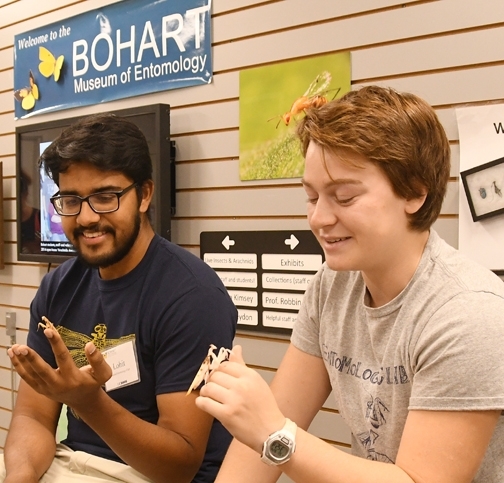 The Bohart Museum is one of the 13 museums or collections on campus where visitors can explore “the diversity of life” on Biodiversity Museum Day. All are within walking distance on campus except for the Häagen-Dazs Honey Bee Haven on Bee Biology Road and the Raptor Center on Old Davis Road. Set from 9 a.m. to 4 p.m., the event is free and open to the public. Parking is also free. Times will vary from 9 a.m. to 1 p.m., and from noon to 4 p.m..
All participating museums and collections have active education and outreach programs, Yang said, but the collections are not always accessible to the public. See capsule information about the museums and collections here. In the event of rain, alternative locations are planned for the outdoor sites. Maps, signs and guides will be available at all the collections, online, and on social media, including Facebook and Twitter, @BioDivDay.